The Bowes Museum is delighted to announce a major new exhibition, CATWALKING: Fashion through the Lens of Chris Moore, from July 2018. The show will present original fashion photographs by Chris Moore, the undisputed king of catwalk photography. 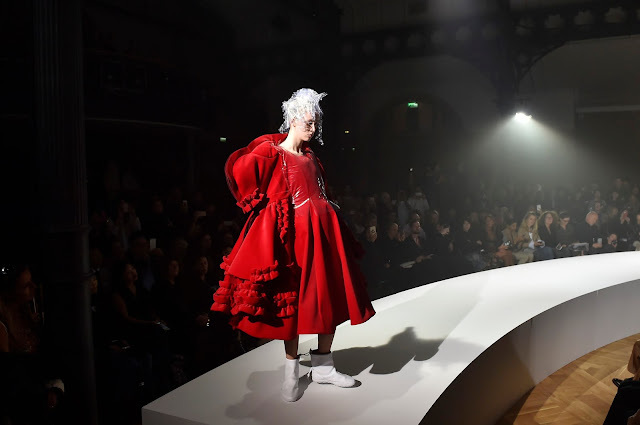 Moore has been at the forefront of fashion for six decades and still today he is capturing all the iconic catwalk moments - in London, Paris, Milan and New York. The exhibition is an exclusive opportunity to see 200 original photographs, chosen by Moore from his extensive archive, capturing the key moments at legendary fashion shows including those at Balenciaga, Chanel, Dior, John Galliano, Comme des Garҫons, Christopher Kane, Alexander McQueen, Yves Saint Laurent and Vivienne Westwood. A selection of original catwalk outfits, as seen in the accompanying photographs, will be lent to the Museum by the world’s leading fashion houses in a unique collaboration. CATWALKING brings a rare insight into the fashion world, with previously unseen images and glimpses of behind-the-scenes at shows. Charting the startling evolution of fashion over six decades, the exhibition demonstrates the impact that new designers had on fashion, the rebirth of haute couture, and the rise of the supermodel. Born in Newcastle, Moore entered the world of fashion in 1954, aged just 20, when he began work at Vogue Studio in London, assisting photographers including Henry Clarke and Cecil Beaton. By the late 1960s he was documenting the collections of designers such as Paco Rabanne, Chanel and Yves Saint Laurent. Moore has worked with all the leading UK national newspapers and is also the founder of Catwalking.com, the first UK website dedicated to catwalk imagery. The exhibition opens on 7 July 2018, running until 6 January 2019.